On a rainy Saturday in New York City, about 40 Colgate alumni and students gathered to spend eight hours together for Colgate’s first-ever off-campus Hackathon, powered by the Digital Media and Technology Professional Network, the Entrepreneur Network, and the Common Good Network. 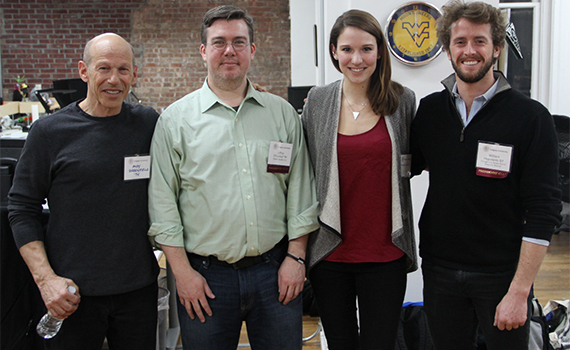 The hackathon was one of many Colgate Day of Impact events held around the country. Hosted by Jeff O’Connell ’94 at his downtown Maker Studios offices, the Colgate Hackathon involved engineers, computer coders, and technicians who helped Amanda Brown ’15 enhance the web presence of her nonprofit venture, Children & Youth First. Maker Studios, with its casual, loft-style space and multiple conference rooms, provided the perfect backdrop for the Hackathon. After a morning introduction, the group broke up into different teams to examine Brown’s project, which was inspired through her work with Thought Into Action. “It was amazing to watch how quickly the groups actually moved from thought to action,” said Wills Hapworth ’07, director of the Thought Into Action Institute. Groups discussed funding strategies, marketing decisions, and internal coding functions that could improve her efforts. These discussions led to the first versions of a crowdfunding platform to assist with construction of a school in Nepal. Vijay Ramachandran, professor of computer science, was on-hand to advise some of his students and participate. The reaction from all the participants “hacking” was universally positive. 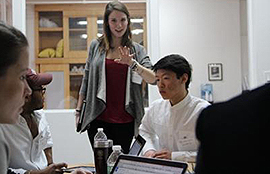 “In all, the event highlighted the tremendous energy that Colgate people have to be engaged intellectually even during their free time, collaborate on creative ideas, and then deliver real results,” said Hapworth. To learn more about the Digital Media & Technology Network, the Thought into Action Entrepreneurship Institute, or Colgate Day of Impact, please visit colgate.edu/alumni.